The use of the Rain Barrel in the garden continues to grow in popularity. What Is A Rain Barrel? It’s simply a container, often 50 -80 gallons in size, used to harvest and store captured rainwater draining from roof runoff. How Does A Rain Barrel System Work? A roof works as a collection surface and as rain falls, the water collects usually in rain gutters. A downspout connects to the barrel using some type of downspout diverter to direct the roof runoff into the barrel via the downspout. Units specifically designed to operate as rain barrels feature a covers to prevent animals, mosquitoes, dust, and light from contaminating stored water. How Much Rainwater Can You Collect? One of the first questions asked by those considering adding a rain barrel system to their garden is. How much water does it take to fill a 55-gallon barrel with water? It takes roughly 1/2 inch of rain to fill the typical 50-55 gallon drum with water from an average roof. Here are the numbers… For every inch of rain falling on 500 square foot of roof, it adds up to approximately 300 gallons of water. Most areas in the US could collect over 1,000 gallons of potable water per year to use in watering container gardens, house plants, vegetable garden and even your lawn. A Money Saver – with this free water conservation source homeowners save on their water bills. Lawn and garden irrigation accounts for 40 % of residential water use according to the EPA. Using rain barrels, homeowners can save roughly 1,300 gallons of water during the growing season. Healthy Plants and Soil – Rainwater does not contain the same additives found in tap water like inorganic ions and fluoride compounds which over time, accumulate in soil. This makes the water goof for venus flytraps. This accumulation can potentially harm plant roots and microorganisms in the soil. 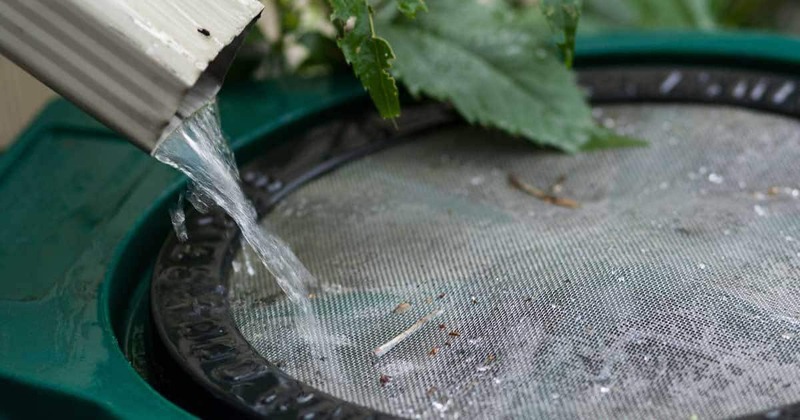 Clean rainwater helps clean the soil of salt buildup which benefits plants and their roots. Reduction of Runoff – Rain barrels help conserve water and reduce stormwater runoff which flows directly into streams, lakes and other nearby bodies of water from storm drains. Rains pick up soil, oil, lawn fertilizer run-off, pesticides and other contaminants that can increase algae growth in lakes for example. Clean water is a precious commodity. Many people around the world would improve the quality of their life if they only had access to clean water. The idea to collect rainwater is not new. However, in today’s “green movement” we see many gardeners install plastic rain barrels by the home foundation to collect water for irrigating their plants and garden. Constructing a rain barrel system is easy (how-to video below). Attaching a spigot or hose bib near the bottom of the barrel allows for the connecting a soaker hose or filling watering cans. You can also connect multiple barrels together to create a rain harvesting system. Before you get excited about collecting rainwater with a barrel – make sure it’s legal! An Oregon man collected rain water on his property and found himself sentenced to 30 Days in jail. There are many ways to go about making a rain barrel, this tutorial from BHG.com shows you how to make an inexpensive rain barrel in a couple of hours. The folks over at DIYnetwork.com have put together their Top 9 DIY rain barrel projects. From making one to installation and some safety tips as well. Check out their projects via DIYnetwork. Rain barrels can often be acquired for a good price or even free, when used. Try Craigslist! You can find rain barrel kits and complete systems to collect rainwater. Fiskars makes one, also Lowes, Home Depot and there’s even one called the Great American Rain Barrel. With proper positioning under downspouts rain barrels can help you collect enough run-off to significantly cut your outdoor watering bill. Rain chains add a beauty to the water collection process as well! As more and more people install and enjoy the benefits rain barrels provide, you’ll find all kinds of variations, tweaks, unique installations and entertaining art! But in order to get the most out of your “water harvest”, make sure it is set up correctly. In late fall, empty, rinse and turn them over. In setting up each spring, rinse the interior and fill to the tap to check for leaks. During cold climates, trapped water can freeze and expand, cracking the plastic. The seal that holds the spigot in place may deteriorate with time and the elements. Some silicone sealer will fix it. We work hard caring for our plants… for food (veggies) or for enjoyment (flowers). The last thing we want to do is put anything on them which could harm the plants or what they produce. Have you considered that the rain barrel water as a potential “harmful” source? No one wants a contaminated rain barrel with potentially harmful substances in it. Sometimes, it can difficult to get motivated to take on the job of giving it a good flush and cleaning. It is important to clean your rain barrel on a regular basis, though. Even though it seems like a dirty job, organicgardening.com shares tips to put you on the path to getting it clean without much fuss. Details via organicgardening.com. Popular Mechanics discusses how to safely capture rain water and guard against bacteria and disease to insure the best water quality. The orchidcarezone.com discusses how to store and keep your rainwater fresh, clean, and ready to use. All this makes for fun talk, but GRIT shares more ideas on how to use the excess water collected using rain barrels in your garden. Rainwater collection works great for watering our plants and our lawn. It also serves as a great way to have rainwater when it’s not raining is to store it in a rain barrel. Now, city water weighs heavy with minerals and chemicals because of the process used to make it safe for us to drink. However, untreated soft rainwater does better for our plants and the soil. For the average home, up to 40% of the water consumed goes to outdoor use such as caring for their lawns and landscapes. With the rain barrel, you can use the collected water even during watering restrictions or when the water supplly is short. It’s nice to have options when you’re caring for your plants and it costs zero. Harvesting rainwater also reduces your eco footprint because you use less of it and it reduces the runoff that carries with it contaminants and sediments making their way into creeks and other water resources. And it’s not a new idea. Ancient civilization harvested their rainwater in cisterns for their communities too. Today, people can choose from many ways to collect rainwater. Some will divert the water directly into the barrel, but once the barrel fills up, all that excess water overflows and some of that can go into your foundation or your basement. Now, this rainwater system from Fiskars works with your existing downspouts and gutters and takes the water away from the house once the barrel becomes full. This worry-free downspout diverter system serves as the key. It channels the water into the barrel, but once the barrel goes full, the back pressure redirects the water to the spout and away from your house the way your gutters were intended to work. Fiskars offers two types of diverters and both work with standard size downspouts. Now, their latest model contains a filter preventing the downspout from getting clogged with debris and a window that lets you see when the filter needs to be cleaned. You spend time making your home look great and working on your lawn and garden. So it only makes sense to have a rainwater harvesting system to compliment it all. Fiskars Rain Barrels come in a variety of sizes, styles and colors to complement your home. And in addition, they are eco-friendly. Now, it helps to put your rain barrel in an area to take advantage of all the rainfall and you want to have it where you’re going to do a lot of watering too. Now on the roof surface of 500 square feet with a 57 gallon barrel, it will fill up in about an hour with a moderate amount of rainfall. It also helps to elevate your barrel to take advantage of gravity to move that water through a hose to other parts of your garden. The main benefits to owning a rain barrel look clear. Installation and maintenance should work easy as well. With a few basic tools, you can install this system. After choosing where to install the rainwater harvesting system, prepare the ground to place the rain barrel. These rain barrels weigh heavy when full. So take the time to make the base firm and level. Install the spigot and hose connector on the rain barrel. Transfer the height of the rain barrel to the downspout and mark reference lines for where the diverter. Cut the downspout on the lines and slide the diverter onto the top section of the downspout. Reattach the lower downspout. Measure and cut the connector hose. With the lid in place, you only need for the rain to pour. Make sure to follow the detailed instructions attached with your system. To winterize the system, remove the filter which came with the diverter and tie the hose up against the downspout. You can also remove the hose and attach the cap included in the system. Next, turn the barrel upside down and put something heavy on it to keep it in place. The Fiskars Rainwater Harvesting System appears and works unique for two primary reasons. First, the diverter channels the water into the barrel until the barrel becomes full and then back to the downspout and away from the house. Secondly, the diverter holds a filter in it to keep the downspout clean and debris-free. The barrel looks really nice, making it a nice addition to your house and garden. Also, it also serves as a great way to lighten your environmental footprint.